This week at Edible Vancouver I canned up some of the most beautiful peaches, scented them with lavender and talked about the woman who taught me how, my Nona. Check it out here if you want the recipe and the story! 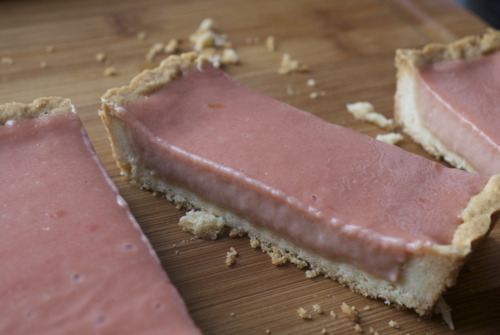 I’ve been watching rhubarb recipes go up on blogs that I follow for several weeks now. Some of them I pinned to make later, some of them I wrote down flavour combinations for, but most of them I jsut glowered at. I’ve been glaring and frowning and giving the stink eye to every blog written by everyone outside of Vancouver because it seems that everyone else has had a month of Spring already, and we are just starting (knock on wood) to get out of the clouds. It was a slow, cold April. So last weekend when I noticed a neighbours rhubarb patch looking healthy I started to get excited and I full blown squealed (to the great alarm of an elderly man passing by me) when I found some at my local green grocer a couple days ago. I love rhubarb I really do. 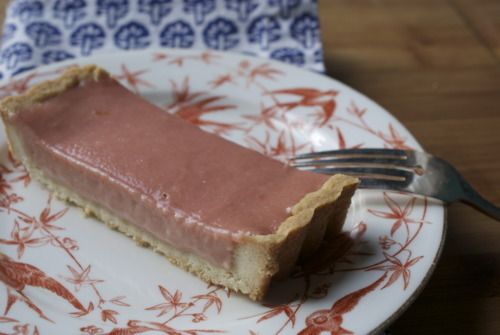 This tart is not as complicated as most tarts, it’s downright easy if you have a food processor, but still totally possible to do without. You don’t need to blind bake the shortbread the way you do with most tarts, and curd comes together in just a few minutes. The lavender is optional if you can’t find it at your local shop although it really does make this extra special. The only hard part is letting it cool before you cut into it. Lightly grease a 10inch-4 inch tart pan. If you don’t have one of those you can use a 6 inch round tart pan. 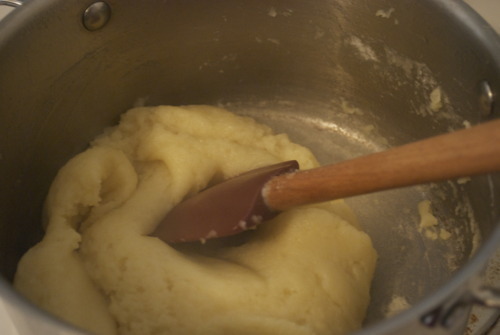 In a food processor combine the sugar, flour, lavender and salt. Pulse until you can barely see the lavender flowers. 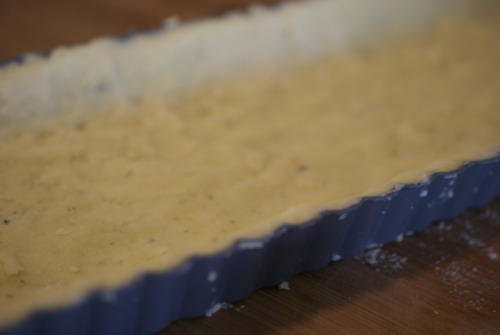 Alternately, you could crush the lavender in a morter and pestal and then add that to the dry ingredients. 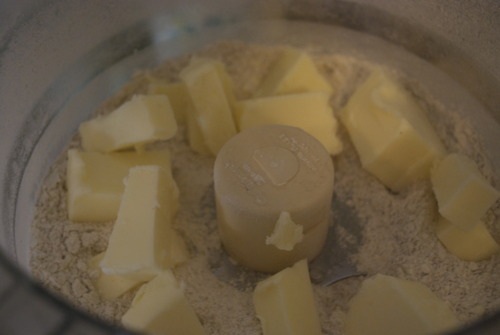 Add in the butter. 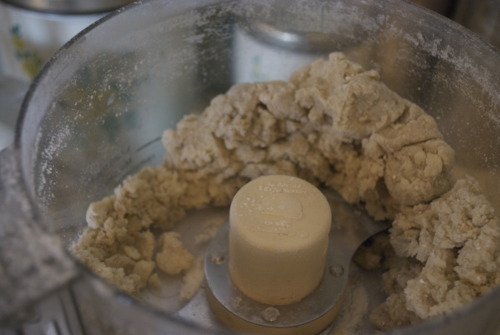 In a food processor you can just pulse it until it becomes a crumbly dough, or you can do this in a standing mixer or by hand. It’s not a big batch. 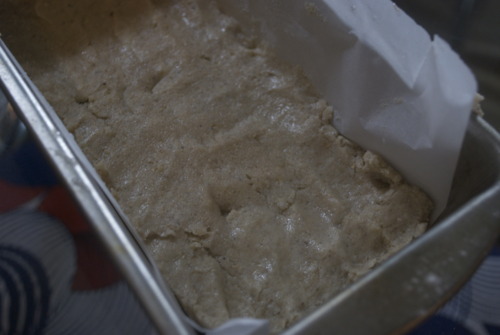 bake it for about 20 minutes, or until it has become a slight golden browncolor. 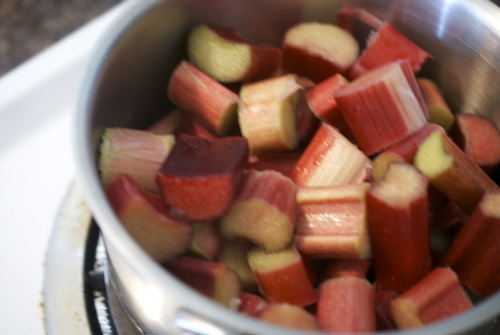 Meanwhile make the curd- Mix half the sugar, the rhubarb and 1/4 cup of water in a pot and simmer on medium heat until the rhubarb falls apart, about 10 minutes. 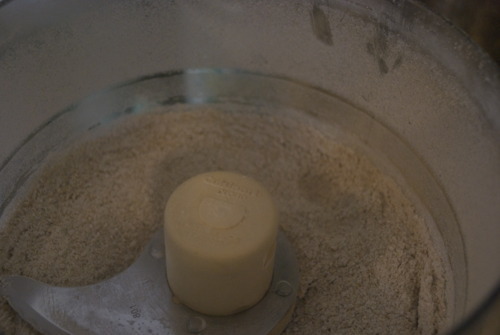 Transfer the liquid into your food processor. Blitz it until it’s quite smooth, then add the sugar. 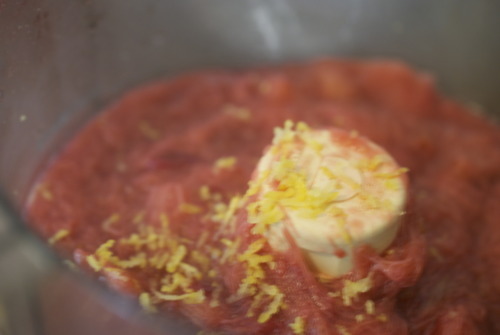 Once that’s combined add in the egg yolks and mix them right away. 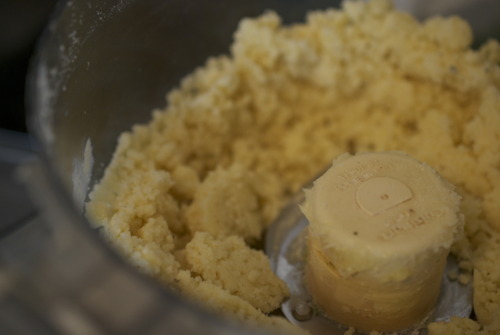 Next add in the butter. It should be a smooth pale color. If you don’t have a food processor don’t worry, this will be beautiful if it’s not pureed, it will just be a little fibrous. 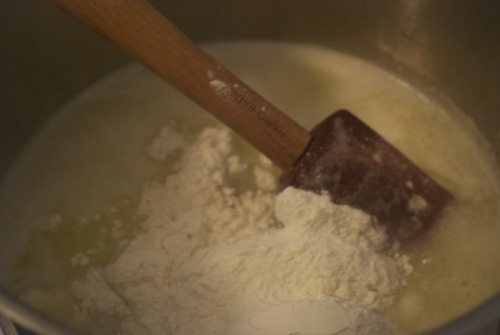 You can whisk in the rest of the ingredients by hand easily too, not a worry. 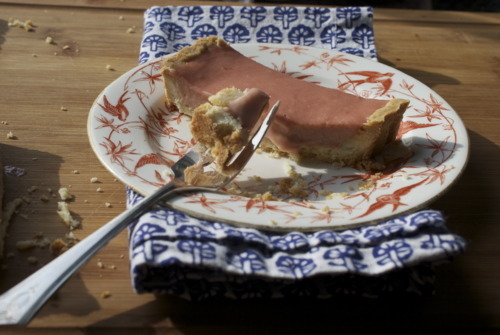 Pour the curd into the tart shell and smooth with a spatula. Bake for about 10 minutes until the top has set. And c’est finis. I’ve been working part time for the last few months at a trendy sandwhich shop called Meat and Bread. It is full of beards, black tee shirts and burly men. I am the token girl. When I first started there it was my only job and I was baking and blogging more often, and I brought them in a lot of treats. But then I got another job, started working 60 hours a week and I am a way less charming employee now. So last week when I got to sleep in and work only the one job (usually I’m up at 4:30am so if I work at 10am it is a great productive morning for me!) I thought I would be sweet and bring them some goodies. 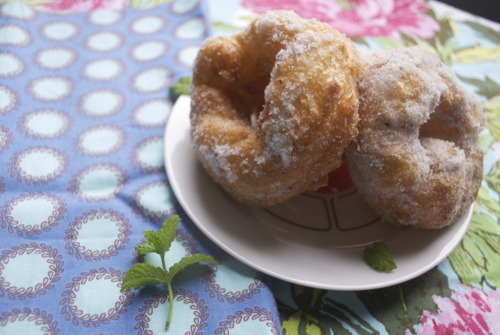 These aren’t really donuts, they are for all technical purposes crullers. 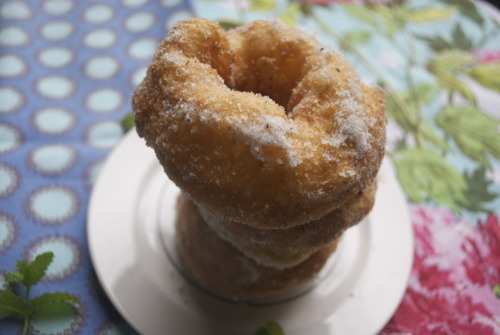 Crullers are donuts simple, friendly, and lovable cousin. They take minutes to put together, can be done by easily by anyone and are just as adaptable in what you put on them. 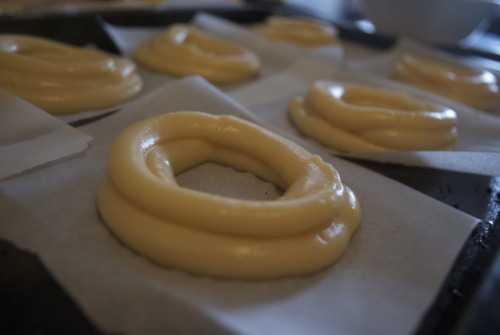 This is the magic of choux paste. 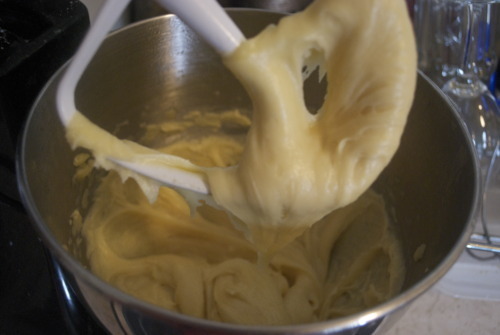 If you bake choux paste and put chocolate on top you have an eclair, if you bake it in little balls and put pastry cream in it you have a cream puff, if you add cheese to the batter and bake it you have gourgeres. 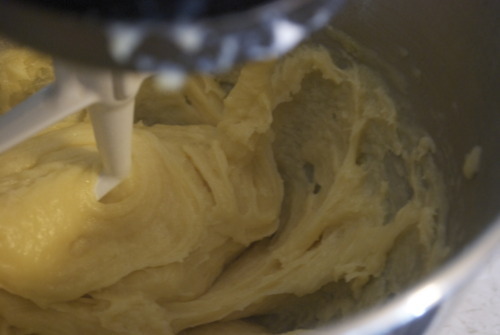 Basically you want to know how to make choux paste. 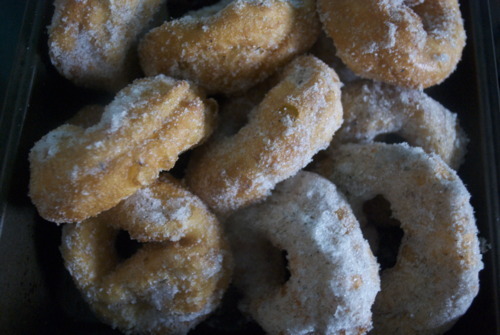 And then you’ll probably want to fry it and toss it in lavender sugar, and then you’ll deffinately want to eat too many. But you’ll be very happy, I promise. 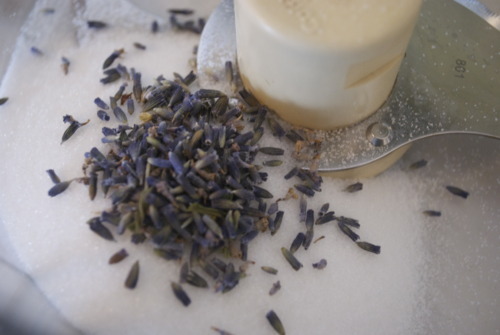 Mix the sugar and lavender in a food processor until the lavender is small and crushed up, or use a mortar and pestal to mash up the lavender and then add it to the sugar. 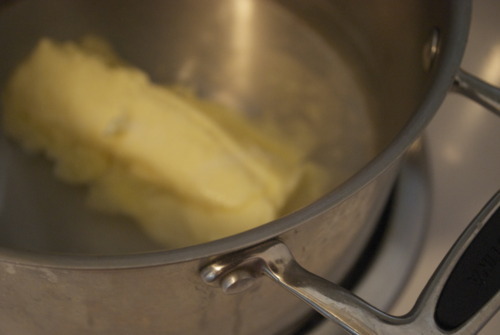 Combine the salt, water and butter in a saucepan and bring to a simmer. And then beat for another minute or two. 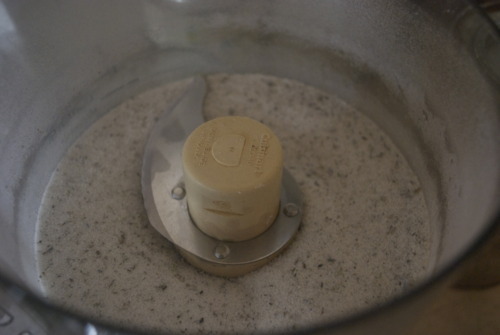 With a mixer fitted with the paddle attachment add the eggs in one at a time beating will between each addition, you could also do this by hand pretty easily. 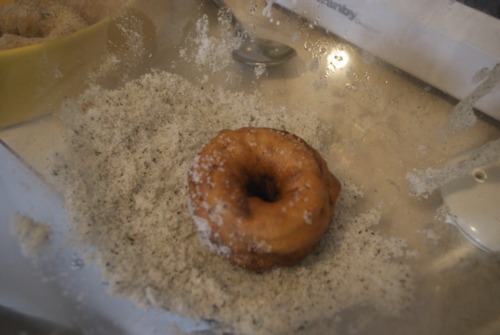 Put the batter into a piping bag and pipe whatever shapes you want. I did the traditional donut shape. 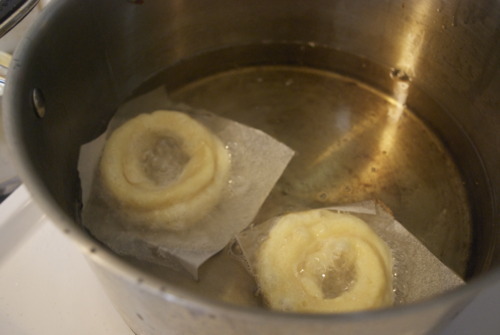 An easy trick: pipe them onto little squares of parchment paper. 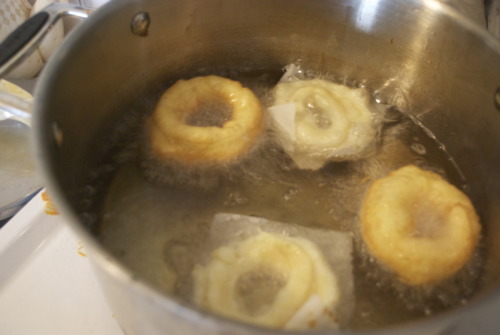 The paper will slide right off when you fry them. Meanwhile heat up the oil, on medium heat until it comes to 350F. If you don’t have a thermometer you can test it by dropping in a drop of water. 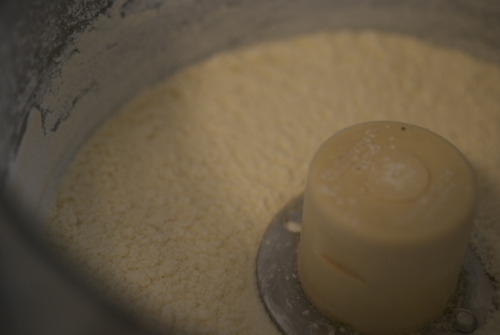 It will drop on the bottom for a second and then will bubble away quite quickly. Thats when you know your oil is ready. So get a couple donuts in! Within a couple seconds the parchment will slide off, and in a minute or two you should flip them with a slotted spoon or tongs. When they’re nice and a deep golden brown toss them into your sugar and then eat them as quickly as you possibly can. Sometimes, when it rains for 7 months straight you so sick of your hair being frizzy that you don’t want to leave your house, and your rain boots have holes in them from to much wear, and even though it’s getting warmer and there are flowers coming up you just don’t care because everything looks grey. It happens. There was an odd sunny day last week and I saw the mountains and thought “They really look bigger then I remember” and then of course I realized that I hadn’t seen the tops of them in months and I was used to thinking that they stopped where the clouds started. Sometimes you just have to accept the rain and make the most of an inside day. These cookies are perfectly melty and crumbly and the oats give just a little more substance and nuttiness and the lavender is not at all perfumey but just gentle and floral. 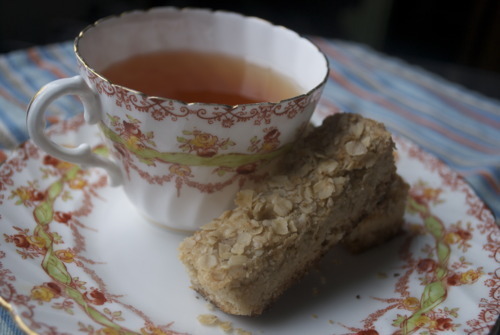 And these go exceptionally well with earl grey tea. 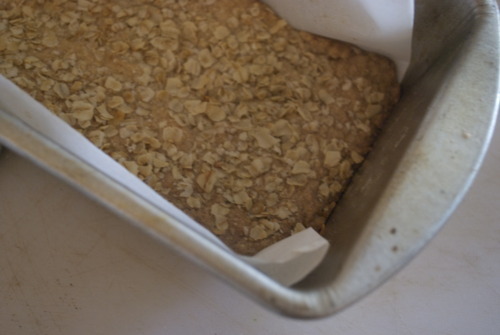 Spread the oats on a baking sheet and bake until just golden and toasty, about 5 minutes. In a food processor pulse the sugar and the lavender until the lavender is broken up, the sugar is fine and it smells a little perfumey from the lavender. 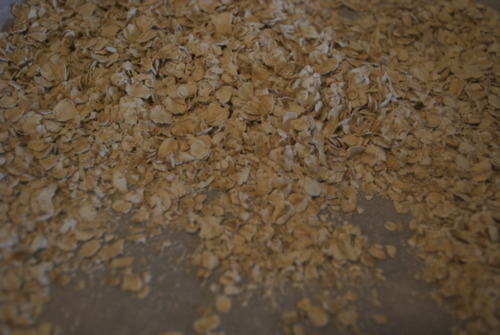 Add in 1/2 cup of the toasted oats and pulse again until they are broken up into very small pieces. Pulse about 10 times until the mixture just comes together. Press into your prepared pan. If its too sticky get your fingers a little wet and then try. 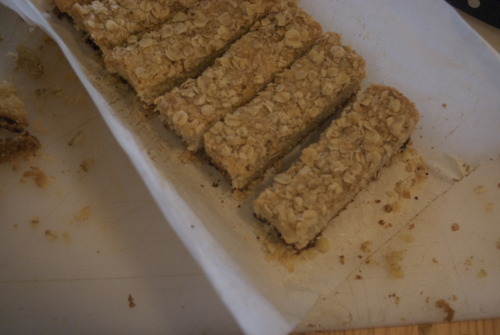 Sprinkle the remaining oats on top. Bake for about half an hour or until the cookies are just beginning to get firm to the touch and the outsides are lovely and golden brown. As soon as they are out of the oven use the parchment to help lift out the cookies and cut them. if you ct them when they are cool thy will crumble. Then do NOT eat them while they are scorching hot like me because you will burn your tongue. Or do, that’s fine too, they are super delicious.